With thousands of alumni around the world, the College of Science has watched many former students accomplish some amazing things in the fields of new technology and life sciences. These brilliant alumni include astronaut Andrew Feustel (Solid Earth Sciences), Nobel Prize-winning physicist Ben Roy Mottelson and Yelp! SVP of Engineering Michael Stoppelman (Computer Science), just to name a few. Every semester, we honor stellar alumni from all of our departments. In the fall, many new Outstanding Alumni are named while in the spring, the College of Science recognizes several new Distinguished Alumni. We also award honorary doctorates most years. Recent recipients include NPR's "Tech Nation" host Moira Gunn (Computer Science), pharmaceutical power John Landis (Chemistry) and Swaminanthan Sivaram (Chemistry), one of the top scientists in India. The Outstanding Alumni of 2017 with College of Science dean, Patrick Wolfe (first row, first person). 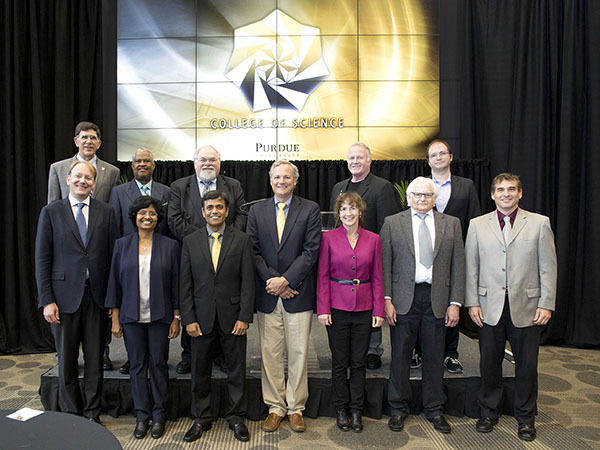 Click on the links under the Recognition section on the sidebar on the left to see information about honors and awards for Purdue alumni.